Originally described as Chaetodon faber by the Fresh Naturalist, Pierre-Auguste-Marie Brousoonet in 1782, the Atlantic Spadefish was later changed to Chaetodipturus faber. The Atlantic spadefish is the only member of its family, Ephippidae, to reside in the western Atlantic Ocean. Its range is limited to the Atlantic Ocean in Massachusetts to south-eastern Brazil. This also includes the northern Gulf of Mexico. It is also found throughout the Caribbean. It is a schooling fish which is found in abundance in shallow marine and brackish waters of shipwrecks, harbours, beaches, and mangroves. It is usually found at depths of about 3 to 35 metres. Juvenile Atlantic spadefish stay in very shallow water and swim at an angle to disguise themselves as dead leaves or mangrove pods to avoid predation. Adult Atlantic spadefish group in schools of about 500 individuals. The Atlantic spadefish is a compressed disk-shaped fish with a blunt snout. It is deep-bodied, and has a small mouth. It is silvery in colour and have around 4 to 6 black vertical stripes on each side of their body. 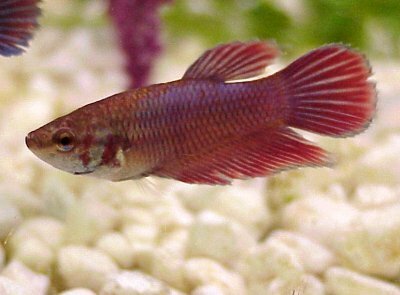 However, the stripes can fade or are obscure on larger fish. The first stripe usually runs through their eye, and the last stripe runs through their caudal peduncle. 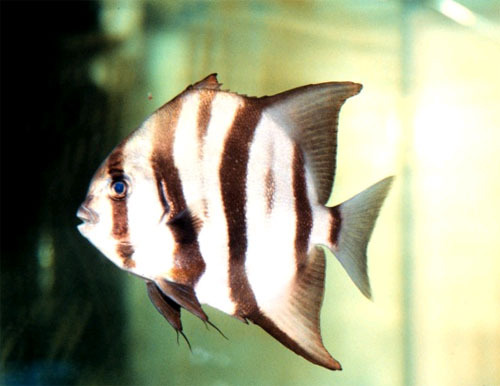 Juvenile Atlantic spadefish are dark brown to black so they appear like dark leaves in the water. This fish reaches a maximum length of 91 cm. It has reported to weigh up to 9 kilograms. Both genders mature at 1 years old, and their expected lifespan is between 8 to 10 years. Atlantic spadefish eat invertebrates. This includes sponges, crustaceans, annelids, mollusks, and cnidarians. They may also eat plankton and nibble on jellyfish tentacles. Feeding occurs all the time, particularly during midday. Known predators of the Atlantic spadefish include sharks such as the smalltail shark, and large fishes such as the tripletail. This fish also has some parasites, such as digeneans and monogeneans. Some of these parasites infest the gill filaments, while others are just found in the gills. 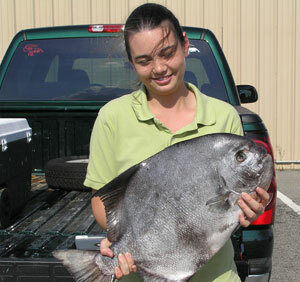 Commercially, the Atlantic spadefish does not have much value. However, recreational fishermen like to catch it because its size and tenaciousness. The flesh of this fish is considered quite good, although it has been associated with ciguatera poisoning. They are often found in large public aquariums, as they have been successfully reared in captivity. In the wild, Atlantic spadefish often swim around scuba divers.